Chicago Cutlery is a brand of cutlery and knives produced by a company who have been in the business for over 80 years. They produce professional standard equipment to be used in the home, as well as by chefs around the world with the aim of making chopping, slicing and carving easy and safe. Their new products include innovative grips that allow superior control as well as non-stick coatings on the blades. They also come in a range of startling colours for those who like their knives to match into their colour scheme! The brand originated in the Chicago meat markets back in 1930 when knives were made for professional butchers and those working in the meat packing plants. They required knives that stayed sharp while being finely honed for the work they did. Chicago Cutlery made these knives and as demand continued to increase, so did their range. In 1969, they began to make knives for use in the home, still maintaining the professional grade. One of the signature range is the DesignPro range of knives. There are six in the series – chef, Santoku, utility, bread, partoku and parer – that are made using their extensive knife making experience. They are made from high quality Japanese stainless steel with comfortable and durable handles using a steel and polymer combination. An innovation in the range lies between the handle and the blade – an indented bolster area that guides the hand to the best position for the maximum amount of control and the best results. Vivid is another of the Chicago Cutlery ranges and incorporates a bit of fun with the practicality of high quality knives. Each of the knives come in different colours so they are easy to identify by colour and also bring their brightness to your kitchen. This 5 piece set is an example of the Vivid range where the blades are made from high carbon stainless steel and the handles are soft grip to allow comfort and control. 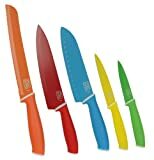 Like other ranges, it has a full lifetime guarantee on the knives and the set includes; 8 inch chef, 8 inch bread, 6.75 inch Santoku, 5 inch utility and 3 ½ inch paring knives in orange, red, blue, yellow and green. This is just a glimpse at the high quality range of Chicago Cutlery from the ultra-sleek professional range of DesignPro to the fun but highly functional quality of the Vivid range. They also offer a range of accessories to work with these knives to help make every cutting job in the kitchen simple and straightforward. Next post: What is a Santoku Knife? Previous post: What Does Induction Mean?